2018 Ram ProMaster Capability Features | Eagle River Chrysler Ltd.
One of the most popular cargo vans on the road today is the Ram ProMaster. Its incredible cargo space paired with some best in class capability features make it the go-to choice for those in a variety of service industries. That is why our team of cargo van experts here at Eagle River Chrysler Ltd located right in Whitecourt is so excited to tell you all about the new 2018 model! First, this cargo van has a best in class turning diameter of just 36 feet. This means that it is easily maneuverable in even the tightest spots. 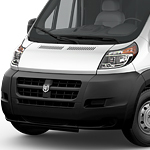 Additionally, the ProMaster comes equipped with a 3.6-liter V6 engine which is sure to please. Not only does it kick out up to 280 horsepower, but it also provides up to 2,313 kg of quality towing. Finally, the full payload capacity is an impressive 2,363 kg, meaning taking two trips will be a thing of the past.